Let me bring the magic of the beach to you! I am touched and eager to share my passion for nature and the beauty of the beach with you. The oceans’ tranquility, pounding surf, and sparkly water make the perfect backdrop to express love and emotion with your message written in the real beach sand. Something about its tumultuous fate, an uncertainty that parallels our own lives makes the beach sand a perfect tablet for expression. 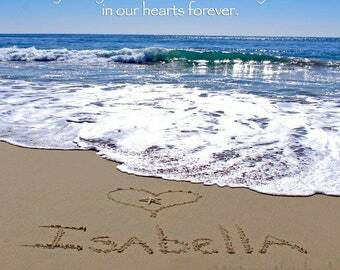 When you see your personalized beach photograph, you will fill like you want jump in your picture as if you were right there, when I wrote your message in the sand. I want to pass along the joy I had in making each photograph a work of art. 1.) Please include the message, name & date you want written in the sand. 2.) What color and photo would you like? Choose from black & white, color, or Sepia. 3.) Do you want a starfish or two sprinkled in your photo or dotting the “I” in your message? 4.) I will go to the beach, write your image in the sand, capture it, then send you a proof via email within 1 week from when you place your order. Once you approve, your order will ship right away. 5.) Viola, a beautifully packaged one-of-a-kind gift will arrive to your doorstep, and you can unwrap the joy of the ocean! 1 to 3 weeks weather permitting. - Working with Mother Nature can be tricky, I will let you know if she is being fussy and I am not able to take the photo within 1 week from your order date. - Each piece comes with a certificate of authenticity. - I sign and date each picture and also let you know the beach each picture was taken at. 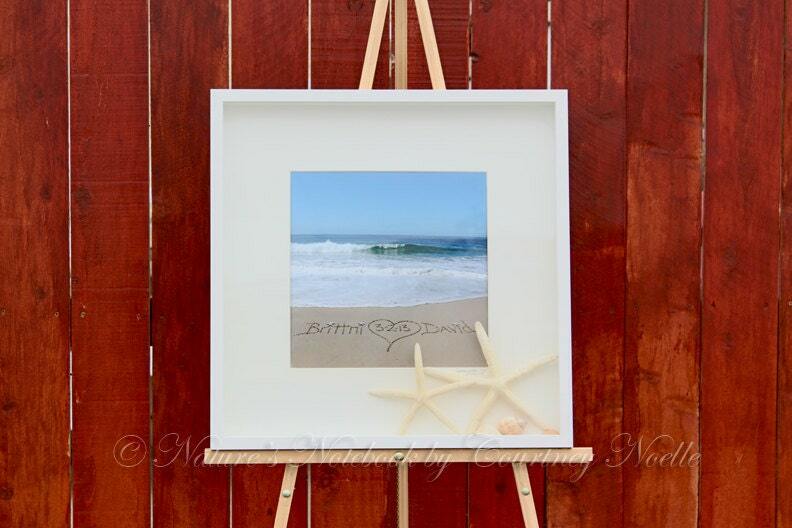 - FREE Gift with every Purchase (5x7 Love Photo) I want to share the LOVE. Feel free to pass this Love photo on as a gift, or hang in your home for years to come. - I actually go to the beach and write your special message on the beach sand and capture it in a professional photo that won't wash away. Please be aware that Mother Nature is always changing and the color and waves will vary from photo to photo. Celebrate all of Life’s Occasions and dedicate the shoreline to your loved ones! Oh goodie gum drops, do I love to hear from my customers. Please feel free to call, email with any questions you may have. I am happy to help in any way I can and look forward to helping you create a one of kind gift. 2nd Year Anniversary Gift for Her - Cotton Anniversary - 100% Cotton Blanket with Names Written in sand, paired with matching wall decor.